The February Road Trip takes us to the beautiful Greenfield Inn Bed and Breakfast in Washington, Virginia. Normally we all think of going to the mountains in the fall to check out the fall foliage, but there are some advantages to visiting the mountains in the winter. Although the green pastures and farm land have taken on a dormant brown color and the leaves have fallen from the trees, the farms are still active and horses and cattle can be observed running in the fields or feeding on the daily hay bale. Life in the country doesn’t stop in the winter, but it does slow down a little bit. This is the time to take advantage of fewer tourists when you visit the wineries and shops and eateries that dot the landscape. 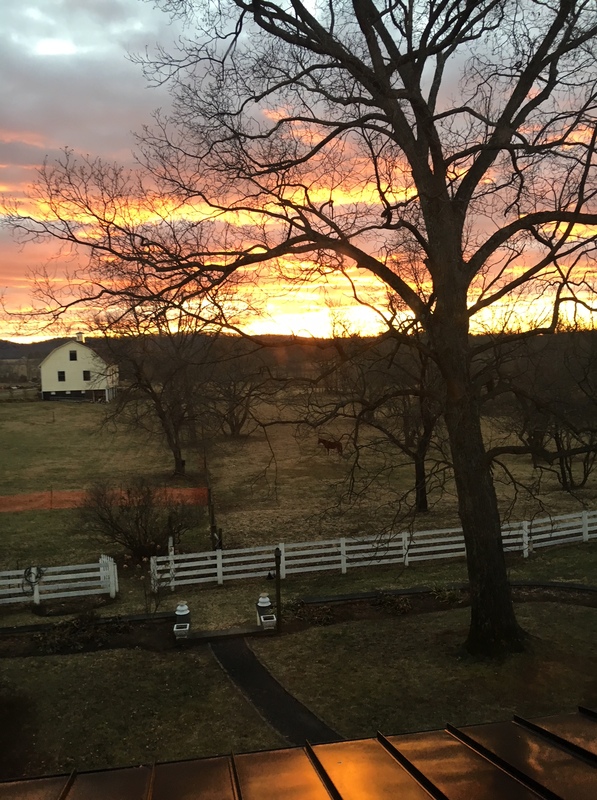 We selected the Greenfield Inn as our destination not only because of the history and beauty of this 83-acre farm but also because of its proximity to the towns of Washington and Sperryville, Virginia. The Inn is a grand southern Georgian-style 1760’s mansion surrounded by gently rolling hills. Its two-pillared entrance provides the gateway to breathtaking views in a relaxing, comfortable setting of understated elegance. Sitting areas and garden spaces invite you to unwind. Centrally located in beautiful Rappahannock County guests enjoy easy access to wineries, breweries and distilleries; antique shops; boutiques; spa; hiking trails in the Shenandoah National Park; Civil War attractions; theater and more. 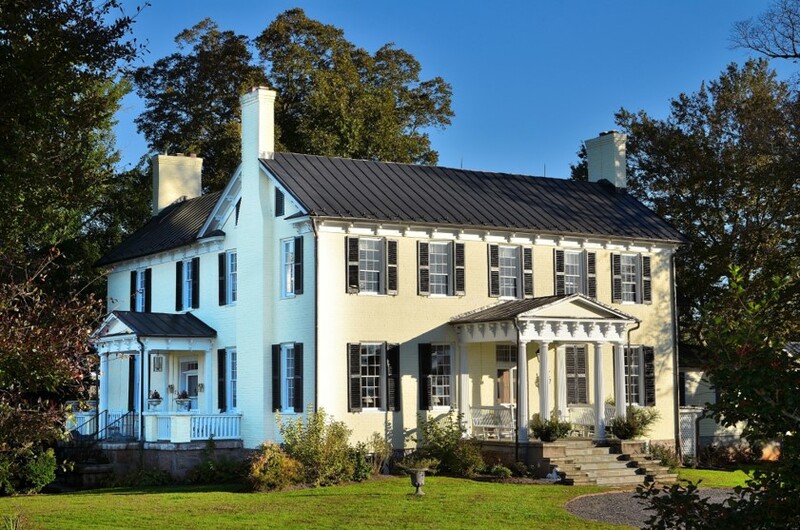 Greenfield Inn Bed and Breakfast is one of the oldest mansions in Rappahannock County. Built between 1767 and 1769, Greenfield, like other older homes, has had many additions over the years but the original 1769 structure is known as the Southern Georgian-style of architecture, which was the dominant style for domestic construction in the colonies from 1700 to 1780. Homes such as Greenfield were commonly found on the Eastern Seaboard where the English influence was concentrated. Greenfield, also known as a central hall and parlor home, includes two stories with a centered five-bay entry with windows that align vertically and horizontally, six working fireplaces and 11-foot ceilings. All of these components contribute to its Southern charm. Greenfield was a private family dwelling to well-established families who were related to past presidents George Washington, James Madison and Zachary Taylor. The home was said to have been a headquarters for both the North and the South during the Civil War. The windows still have the original glass, providing distorted views through the panes in some locations, as the air bubbles of the handmade glass transport you to years past. The Inn offers five different rooms, all beautifully decorated. We were placed in the Nathan Bedford Forrest Room, a spacious, elegant room, in a soothing shade of lavender, located on the second floor of the main house. The room featured spectacular views of the Blue Ridge Mountains from the west side along with stunning sunsets and overlooking the vineyard from the north. 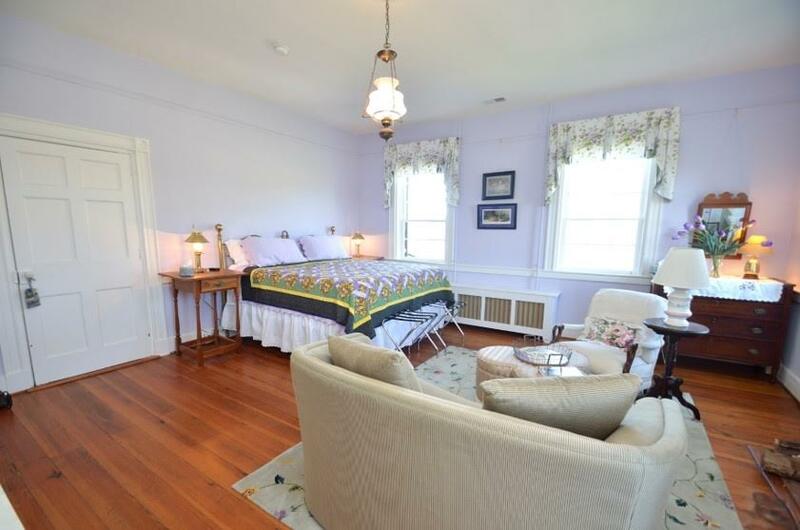 The room also offers a wood-burning fireplace and a king-size antique bed. A welcoming loveseat and antique rocker are nestled next to the fireplace in this charming, comfortable room. Rest your feet on the center ottoman and sip a glass of wine while you enjoy the warmth of the fire on a cold winter night. The private bath is just outside the bedroom door with a claw-foot soaking tub, rain-showerhead, luxury toiletries and cozy plush bathrobes. There are no TVs in the rooms, which is something I like, however there is a large sitting room complete with a wraparound leather couch and a large screen TV. One wall in the room is a large bookshelf stocked with just about anything you would want to read. The opposite side of the room is all windows, which open up to a beautiful view of the mountains. It was here that I discovered one of the reasons to come in the winter. At this time of the year the sun rises directly over the mountains making for a perfect photograph. There is a massive tree between the sun and the window but in winter the leaves are gone and the photograph is possible. As the sun moves to the north each day it is not visible from this room during the summer months. 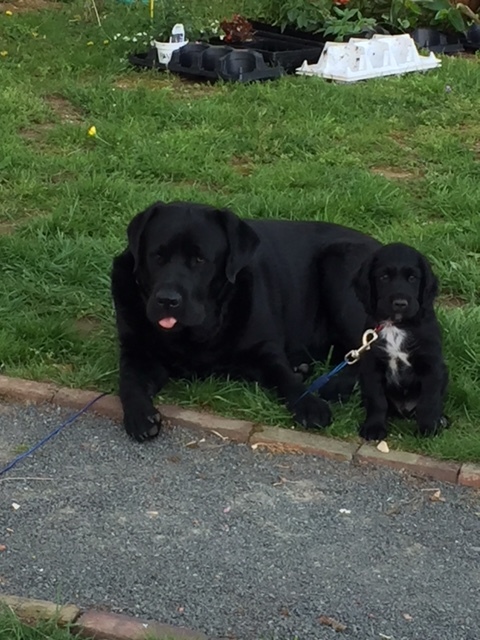 Greenfield Inn is now in the very capable hands of Audrey and Al Regnery and their canine Ambassadors – Mosby and Bay Lee – who are on the welcoming committee. They have done an extensive amount of work in and around the property since they have been there. The grounds are taking on a fresh look with the inclusion of a pond and some pretty impressive landscaping. We are looking forward to seeing the hundreds of bulbs that will soon be peeking out of the ground in the next couple of months. I would be remiss if I didn’t mention the “breakfast” part of this adventure. Audrey prides herself on the three-course first meal of the day that she puts together. The morning we were there we were treated to a starter of a trio of Greek yogurt, gluten-free granola and some of the freshest berries I have had in a long time. 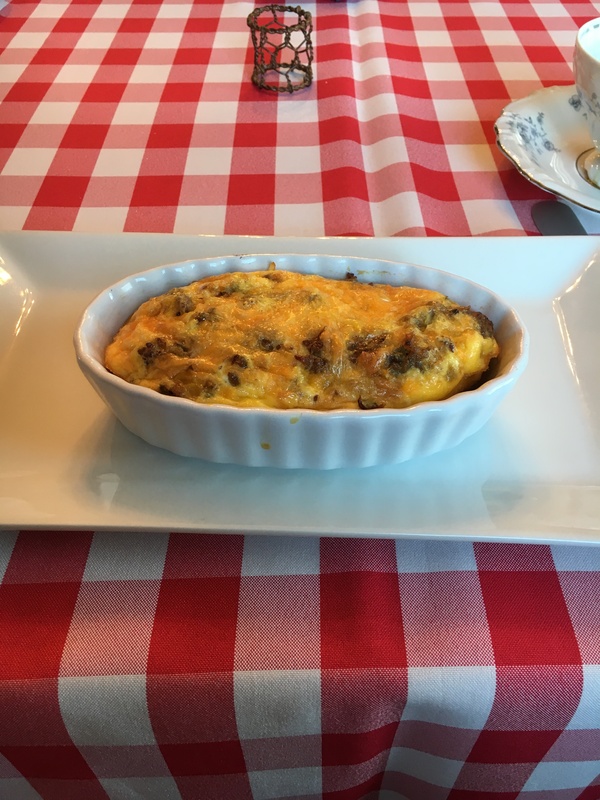 Followed by individual breakfast casseroles made with fresh eggs from the chickens in the backyard, mild Italian sausage, cheese, green pepper, and onion and ending with her recipe for a New Orleans-style bread pudding. You won’t go hungry when you leave here for sure. The small vineyard at the Inn is made up of about 700 vines and will be producing estate wine for Greenfield Inn. Gadino Cellars, which is located a few miles away, are helping Audrey with her vineyard. It looks like the future holds sipping Greenfield Estate Cabernet Franc by the fireplace or in the future gazebo by the pond. As I mentioned earlier, the towns of Washington and Sperryville are nearby and each offer dining, shops and an assortment of activities. 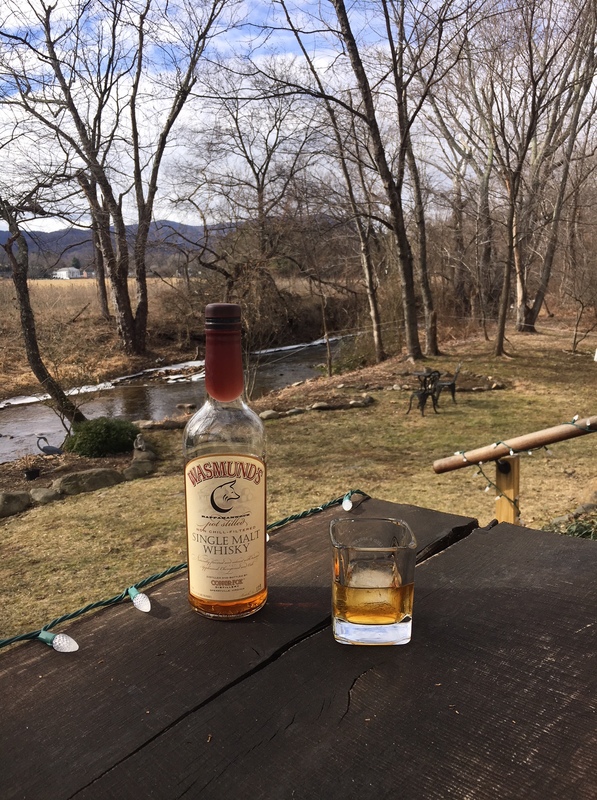 A couple of our favorite places in Sperryville are Before & After – a really cute and fun eatery – and Copper Fox Distillery – home of the original Wasmunds Single Malt American Whiskey. The town of Washington is very close to Greenfield and just walking around this small village is a treat and, of course, it is home to the much celebrated Inn at Little Washington. We have been told that even if your pocket book doesn’t include the resources to stay or dine here, just having a cocktail at the Monkey Bar in the Inn is an experience to be had. A couple of our favorite places in Washington are Tula’s Restaurant and Little Washington Spa & the Loft. Both Tula’s and The Spa are owned and operated by former local Alexandrians and friends and worth checking out as is r.h. ballard shop & gallery with their eclectic inventory. February is a good month to avoid the crowds and get to know the locals as well as a time to celebrate a special Valentine’s Day at Greenfield and spend that extra day on Presidents Day weekend…visit the Blue Ridge in the winter for a brand new perspective on the countryside. There are a handful of good wineries – one of our new favorites is Quievremont on Gid Brown Hollow Road – where you can get individual attention and learn about the region. An added treat during the winter is that on a clear night you can see the stars and even the Milky Way. Greenfield is also a great destination for weddings and special gatherings. Detailed information is available on their website.